In the mobile environment, the location and the next move of subscribers are important. In this study, a method to detect the next move of the subscribers is proposed. In addition to the categorization of subscribers by using their Internet usage history, the knowledge of the next move pattern of subscribers will provide the flexibility to guide them to decide the next move. During the tracking of subscribers, the mobile devices of the subscribers are used as sensors to get in-depth knowledge about their preferences in their social life. The method presented here is the first in the literature to estimate the next move without connecting to any social networks. It combines the geographic locations and the Internet usage of the subscribers in order to predict their movement. In addition, most of the IoT studies either concentrate on network topologies or power consumption, while in this study, dynamicity and exact location estimation are utilized to handle the challenges and attain the required results. The results of the experiments show that the proposed system predicts the next move of a subscriber with a precision of more than 90 percent. R. van der Meulen, "Analysts to explore the value and impact of iot on business at gartner symposium/itxpo 2015, november 8-12 in Barcelona, Spain." B. C. Villaverde, R. de Paz Alberola, A. J. Jara, S. Fedor, S. K. Das, and D. Pesch, "Service discovery protocols for constrained machine-to- machine communications." IEEE Communications Surveys and Tutorials, vol. 16, no. 1, pp. 41-60, 2014. P. K. Verma, R. Verma, A. Prakash, A. Agrawal, K. Naik, R. Tripathi, M. Alsabaan, T. Khalifa, T. Abdelkader, and A. Abogharaf, "Machine- to-machine (m2m) communications: A survey," Journal of Network and Computer Applications, vol. 66, pp. 83-105, 2016. K. Oztoprak, "Profiling Subscribers According to Their Internet Usage Characteristics and Behaviors," in Proceedings of the IEEE Big Data. IEEE, 2015, pp. 1492-1499, Santa Clara, October 2015. K. Oztoprak, "Subscriber Profiling for Connection Service Providers by Considering Individuals and Different Timeframes," IEICE Transactions on Communications, vol. 99, no. 6, 2016. X. Chang, Y. Yi, Y.Lingyun, S. Purui,and F. Dengguo,"Automated User Profiling in Location-Based Mobile Messaging Applications," in Trust, Security and Privacy in Computing and Communications (TrustCom), 2014 IEEE 13th International Conference on. IEEE, September 2015, pp. 18-26. P. Burge and J. Shawe-Taylor, "An Unsupervised Neural Network Approach to Profiling the Behavior of Mobile Phone Users for Use in Fraud Detection," Journal of Parallel and Distributed Computing, vol. 61, no. 7, pp. 915-925, 2001. 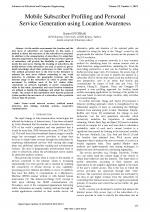 P. Loskot, M. A. M. Hassanien, F. Farjady, M. Ruffini, and D. Payne, "Long-term drivers of broadband traffic in next-generation networks," Annals of Telecommunications - Annales Des Telecommunications, vol. 70, no. 1-2, pp. 1-10, 2014. J. Ghosh, M. J. Beal, H. Q. Ngo, and C. Qiao, "On Profiling Mobility and Predicting Locations of Wireless Users," International Workshop on Multi-hop Ad Hoc Networks: from Theory to Reality, pp. 55-62, 2006. S. Lee, J. Lim, J. Park, and K. Kim, "Next place prediction based on spatiotemporal pattern mining of mobile device logs," Sensors, vol. 16, no. 2, p. 145, 2016. L. Vintan, A. Gellert, J. Petzold, and T. Ungerer, "Person movement prediction using neural networks," Technical Report of University of Augsburg, vol. April, no. 10, 2004. S. Akoush and A. Sameh, "Mobile user movement prediction using bayesian learning for neural networks," Proceedings of the 2007 international conference on Wireless communications and mobile computing - IWCMC '07, p. 191, 2007. N. Phamand, T. Cao, Knowledge and Systems Engineering: Proceedings of the Fifth International Conference KSE 2013, Volume 1. Cham: Springer International Publishing, 2014, ch. A Spatio-Temporal Profiling Model for Person Identification, pp. 363-373. L. Cortesao, F. Martins, A. Rosa, and P. Carvalho, "Fraud Management Systems in Telecommunications: a practical approach," in Proceeding of 12th International Conference on Telecommunications, 2005, pp. 167- 182. M. Lin, H. Cao, V. Zheng, K. C.-c. Chang, and S. Krishnaswamy, "Mobility Profiling for User Verification with Anonymized Location Data," in Proceedings of the 24th International Conference on Artificial Intelligence. AAAI Press, 2015, pp. 960-966. C. S. Hilas and J. N. Sahalos, "User profiling for fraud detection in telecommunication networks," 5th International Conference on Technology and Automation, pp. 382-387, 2005. M. M. Ko and M. M. S. Thwin, "Anomalous Behavior Detection in Mobile Network," in Genetic and Evolutionary Computing. Springer International Publishing, 2015, pp. 147-155. J. H. Schumann, F. von Wangenheim, and N. Groene, "Targeted Online Advertising: Using Reciprocity Appeals to Increase Acceptance Among Users of Free Web Services," Journal of Marketing, vol. 78, no. 1, pp. 59-75, 2014. H. Haddadi, P.Hui,and I.Brown, "MobiAd: private and scalable mobile advertising," Proceedings of the fifth ACM international workshop on Mobility in the evolving internet architecture, pp. 33-38, 2010. I. Ullah, R. Boreli, M. A. Kaafar, and S. S. Kanhere, "Characterising user targeting for in-app mobile ads," in Computer Communications Workshops (INFOCOM WKSHPS), 2014 IEEE Conference on. IEEE, 2014, pp. 547-552. H. Fujimoto, M. Etoh, A. Kinno, and Y. Akinaga, "Web user profiling on proxy logs and its evaluation in personalization," Lecture Notes in Computer Science (including subseries Lecture Notes in Artificial Intelligence and Lecture Notes in Bioinformatics), vol. 6612 LNCS, pp. 107-118, 2011. G. Castellano,A.M.Fanelli, C. Mencar, and M.A.Torsello,"Similarity- Based Fuzzy Clustering for User Profiling," 2007 IEEE/WIC/ACM International Conferences on Web Intelligence and Intelligent Agent Technology - Workshops, pp. 75-78, 2007. K. Makvana and P. Shah, "A novel approach to personalize web search through user profiling and query reformulation," in Data Mining and Intelligent Computing (ICDMIC), 2014 International Conference on. IEEE, 2014, pp. 1-10. M. D.Hall and N.Kanar, "Method delivering location-base targeted advertisements to mobile subscribers," US Patent: US7027801 B1, 2006. J. Wilson, C. Kachappilly, R. Mohan, P. Kapadia, A. Soman, and S. Chaudhury, "Real World Applications of Machine Learning Techniques over Large Mobile Subscriber Datasets," arXiv:1502.02215 [cs], pp. 1-9, 2015. Z. Zhang, L. Zhou, X. Zhao, G. Wang, Y. Su, M. Metzger, H. Zheng, and B. Y. Zhao, "On the validity of geosocial mobility traces," in Proceedings of the Twelfth ACM Workshop on Hot Topics in Networks - HotNets-XII, 2013, pp. 1-7. A. Noulas, S. Scellato, N. Lathia, and C. Mascolo, "Mining user mobility features for next place prediction in location-based services," Proceedings - IEEE International Conference on Data Mining, ICDM, no. April, pp. 1038-1043, 2012. B. Zheng, K. Thompson, S. S. Lam, S. W. Yoon, and N. Gnanasambandam, "Customers' Behavior Prediction Using Artificial Neural Network," IIE Proceedings of the 2013 Industrial and Systems Engineering Research Conference, pp. 700-709, 2013. K. D. Bahn, "Characterizing Consumer Interest Through the Use of Canonical Correlation: Application for Small Business," in Proceedings of the 1982 Academy of Marketing Science (AMS) Annual Conference Part of the series Developments in Marketing Science, 1982, pp. 519-524. 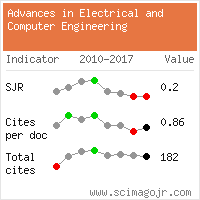 Citations for references updated on 2019-04-15 19:10 in 127 seconds.